I’m not going to win a price on originality here writing about one of the greatest Jazz groups in history, Art Blakey’s Jazz Messengers. They’ve been praised over and over again over the last 50 years. But never mind, my purpose was to write about music I really like, and the hard-bop era is one of my favorites in the entire Jazz history. And probably hard-bop wouldn’t be hard bop without the Jazz Messengers. Therefore, I’m starting this little mini-series about the Jazz Messengers and their spin-offs. Starting in 1954, this group around the drummer Art Blakey was composed of an ever-changing group musicians that would pretty much all go on great solo careers, including, little known fact, Keith Jarrett at some point (in a way you could say Art Blakey discovered Jarrett). Other outstanding musicians include Wayne Shorter, Lee Morgan, Benny Golson, Clifford Brown, Curtis Fuller. By the way, most Jazz Messengers albums are worth having, including At the Café Bohemia, A Night In Tunisia, Caravan, and obviously, Moanin’. The original quintet from 1954 was composed of Horace Silver, Kenny Dorham, Hank Mobley, and Doug Watkins. One of my next entries in this series will be about Mobley, who has done some great albums. But given that I have a piano background, let me start with the pianists of the group, Horace Silver. And let me start immediately by what is probably his greatest album, Song For My Father. Recorded in 1963 and 1964, and released in 1965, this album falls around the end of the hard bop period, before most Jazz musicians moved on to “Free Jazz” and “Fusion” (to me an absolute dead-end in music), and it took until the 1980s to get back to a some form of revival of hard bop. (Some say the sale of the Blue Note label in 1966 also significantly contributed to the decline of hard bop). 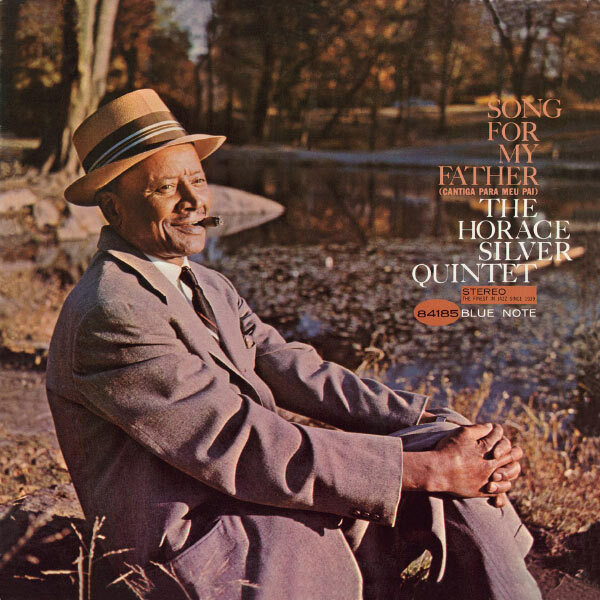 On this album, Horace Silver records with two groups of musicians, the first one includes Carmel Jones, Teddy Smith, Roger Humphries and the great Joe Henderson (tracks 1, 2, 4, and 5), the second one being Blue Mitchell, Gene Taylor and Roy Brooks. By the way, the initial group of Horace Silver in his earlier recordings were pretty much “stolen” directly from the 1954 Jazz Messengers group (only Art Blakey stayed on). As usual, I’m not going to write a track by track review of an album, I usually find those rather tedious to read, especially in the internet age where everybody can just listen to the tracks anyhow. Let me just point out my two favorite tracks on the album, which are the title track, and Calcutta Cutie. Both songs exceed 7 minutes, a great duration for a jazz song because it really allows for several solos that are really outstanding. But luckily, on this great album, even if you have the CD version with some bonus tracks, there are really no weak tracks. Other Horace silver albums that are worth exploring include Blowing the Blues Away, Horace-Scope, The Tokyo Blues, and The Cape Verdean Blues (notice a lot of blues in there? well, that’s probably what’s so special about Silver in the first place, his bluesy tone). Usually I don’t intend to write about technical details here, this blog should be dedicated to music, but if you intend to purchase this album please don’t buy the CD, especially not the RVG remaster series. The most recent 2012 remaster is released in 24 bit and 192khz format and is available on several sites including Qobuz, HDTracks and ProStudioMasters. Even if you don’t believe in the benefits of higher resolution than CD, the remastering of the recording per-se is way better than all previous versions I’m aware off. Nice review. This is the only Horace Silver CD In my collection and you reminded my to acquire more. I’m enjoying your blog btw and hope you continue sharing your insights. And I just noticed I forgot to recommend The Cape Verdean Blues, just edited my blog above accordingly. Thanks a lot for sharing! I could not agree more to your view! I also believe that what followed on Hardbop was either a dead end (Fusion) or important but not everybody’s cup of tea (Free Jazz). Blakey and his Jazz messengers were also important to bring back the good stuff into Jazz in the 80’s as some important figures in Neo-Bop like Marsalis or Blanchard were part of the Messengers before launching their solo careers. Thanks for your comment. I was even thinking of mentioning the role of Marsalis etc but felt it would bring me too far off-topic. That said, I’m glad we had the revival in the 80s and can listen to great live Jazz today. Indeed a great thing for a great music!